The SNP's leader at Westminster has called for stronger action against Russia in the wake of the Salisbury nerve agent attack. Ian Blackford said it was clear the attack was an "act of state terrorism". And he said tougher financial sanctions were needed to make Russia "sit up and take notice". Mr Blackford also described the RT channel, on which the party's former leader Alex Salmond hosts a show, as a "tool of the Russian state". He said it was "now clear what the Russian authorities have been up to in the United Kingdom", and urged people to "think very carefully about being seen on that channel". Former Russian spy Sergei Skripal, 66, and his daughter Yulia, 33, were poisoned with Novichok in Salisbury on 4 March. Both recovered after spending several weeks in hospital. Det Sgt Nick Bailey also fell ill after responding to the incident, while the attack was linked to a separate Novichok poisoning on 30 June, which led to the death of Dawn Sturgess. British authorities believe the attack was carried out by two men who are said to be members of Russia's GRU military intelligence service. 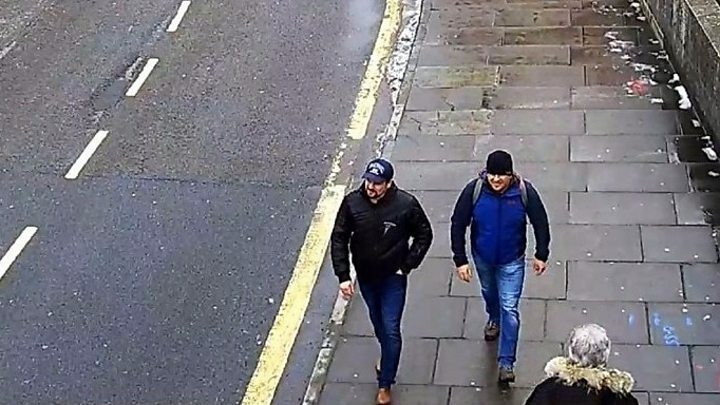 They entered the UK using the names Alexander Petrov and Ruslan Boshirov before returning to Moscow shortly after Novichok was sprayed on Mr Skripal's front door. Moscow strongly denies any involvement in the attack. But speaking to the BBC's Good Morning Scotland programme, Mr Blackford said it was "very clear that this was state sponsored terrorism that took place in the streets of the United Kingdom, and I think there's a sense of real sadness that Putin believes that his regime can behave in this way." He urged the UK and its allies to now "send a very clear message to Russia that this kind of behaviour won't be tolerated." Could Novichok attack suspects be returned to the UK? Mr Blackford said: "We have a very clear picture of what happened around these days in March when these two agents of the Russian military intelligence service came to the UK, and there has to be a united and a very clear response from all of us. "This attack that happened in Salisbury could happen anywhere and we need to make it very clear to the Russians and particularly to President Putin that this kind of behaviour cannot be tolerated." Less famous than the KGB - or its successor, the FSB - the GRU plays a shadowy but important role in Moscow's strategic plans. It is Russia's military intelligence arm, reporting directly to the defence minister. It has extensive cyber and signals operations and has been accused of hacking and online sabotage. GRU officers are often stationed in embassies around the world and many were expelled after the Salisbury attack in March. Since 2013 Russia's elite Spetznaz (Special Purpose) Special Forces have been part of the GRU's command structure and are believed to have played a part in the annexation of Crimea in 2014. British government officials maintain that the GRU's operations include assassinations both inside Russia and overseas. Sergei Skripal served in the GRU as a military intelligence officer in Afghanistan in the 1980s. In 2006 he was arrested and jailed after reportedly betraying the names of his GRU colleagues to Britain's MI6. In 2010 he was allowed to leave for Britain as part of a prisoner swap, but in the Kremlin's eyes he will always be seen as a traitor. Mr Blackford argued that previous attempts at imposing sanctions against Russia had not gone far enough, and that a blind eye had been turned to "some of the things that are going on". He said it was a "real scandal" that people linked to Mr Putin's regime had been able to launder millions or even billions of pounds of "dirty money" through Scottish Limited Partnerships, and called for action to ensure it could no longer happen. The MP said: "I think we really need to look at how we can use financial measures, how we can really tighten the screw on the regime in Moscow, to get to a situation where we can get to more normalised relationships with that country." When asked whether he was "embarrassed" by Mr Salmond's show on RT, which is produced by former SNP MP Tasmina Ahmed-Sheikh, Mr Blackford said it was "really a matter for Alex that you should put to him". But he continued: "I think it's now clear what the Russian authorities have been up to in the United Kingdom and I think people have to reflect upon that. "And I would simply say that there is very clear evidence that in effect RT is a tool of the Russian state. People should dwell on that information and think very carefully about being seen on that channel."